"Separate Ways (Worlds Apart)" / "Frontiers"
"Faithfully" / "Edge of the Blade"
"After the Fall" / "Only Solutions"
"After the Fall" / "Rubicon"
"Send Her My Love" / "Chain Reaction"
"Ask the Lonely" / "Troubled Child"
Frontiers is the eighth studio album by the American rock band Journey, released in February 1983 on the Columbia Records label. This is the last album to feature bassist Ross Valory until 1996's Trial by Fire. The album reached No. 2 on the Billboard 200 chart and would garner four top 40 singles: "After the Fall" (No. 23), "Send Her My Love" (No. 23), "Faithfully" (No. 12), and "Separate Ways (Worlds Apart)" (No. 8), and a rock radio hit in "Chain Reaction". The album would later achieve the RIAA certification of six times platinum. The album had been sequenced and prepped for pressing when, in a last minute conference with Journey's A&R man Michael Dillbeck, two songs were pulled from the original lineup, "Ask the Lonely" and "Only the Young". These two tracks were replaced with "Back Talk" and "Troubled Child". "Ask the Lonely" was utilized in the soundtrack for the film Two of a Kind. "Only the Young" would find its way into the Top Ten two years later, as part of the soundtrack of the movie Vision Quest. Frontiers was the band's highest-charting album in the United Kingdom, reaching No. 6 on the UK Albums Chart in 1983. Frontiers was a subtle shift. Mouse and Kelley were not involved with that cover. My vision for Frontiers was based on "tunnels" and the relativity of time and motion. Light stays the same, but time bends. It was Einstein theories for artist interpretation. 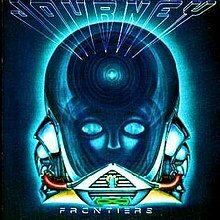 The alien in Frontiers wasn't really an alien at all, he was a connection to a higher level of listening to Journey. In 2005, Frontiers was ranked number 363 in Rock Hard magazine's book of The 500 Greatest Rock & Metal Albums of All Time. Randy Jackson - Bass on "After the Fall"
^ a b "Frontiers Billboard Albums". AllMusic. Rovi Corporation. Retrieved 2013-07-15. ^ a b c d e f g h i "Frontiers Billboard Singles". AllMusic. Rovi Corporation. Retrieved 2013-07-15. ^ a b RIAA Gold and Platinum Search for albums by Journey. Retrieved on 2013-06-30. ^ a b "Journey Official Charts". Official Charts Company. Retrieved 2013-07-14. ^ "Journey WWW Page Exclusive Interview". ^ DeGagne, Mike. "Journey Frontiers review". AllMusic. Rovi Corporation. Retrieved 2013-07-15. ^ Considine, J. D. (14 April 1983). "Album Reviews: Journey - Frontiers". Rolling Stone. Archived from the original on 22 December 2007. Retrieved 2013-07-15. ^ Christgau, Robert (26 July 1983). "Christgau's Consumer Guide". The Village Voice. New York. Retrieved 14 November 2015. ^ [...], Rock Hard (Hrsg.). [Red. : Michael Rensen. Mitarb. : Götz Kühnemund] (2005). Best of Rock & Metal die 500 stärksten Scheiben aller Zeiten. Königswinter: Heel. p. 65. ISBN 3-89880-517-4. ^ "Top Albums/CDs - Volume 38, No. 3, March 19, 1983". Library and Archives Canada. 19 March 1983. Retrieved 2013-07-16. ^ "Journey - Frontiers (album)". Norwegiancharts.com. Media Control Charts. Retrieved 2013-07-16. ^ "Journey - Frontiers (album)". Swedishcharts.com. Media Control Charts. Retrieved 2013-07-16. ^ "Album – Journey, Frontiers". Charts.de (in German). Media Control Charts. Retrieved 2013-07-16. ^ ジャーニー - クイーンズライクのアルバム売り上げランキング (in Japanese). Oricon. Retrieved 2013-02-17. ^ "Top Singles - Volume 38, No. 4, March 26, 1983". Library and Archives Canada. 26 March 1983. Retrieved 2013-07-16. ^ "Top Singles - Volume 38, No. 15, June 11, 1983". Library and Archives Canada. 11 June 1983. Retrieved 2013-07-16. ^ "Gold Platinum Search for Journey". Music Canada. Archived from the original on 2012-02-25. Retrieved 2013-07-14.